Two ships were struck by mines in the Persian Gulf war, the USS Tripoli and the USS Princeton. Both of these happened in the northern part of the gulf waters. Before the war, we were anchored out off the coast of Bahrain. Even before hostilities officially began there were rumors that there were mines in the harbor. This made the crew a little bit skittish. We wondered, what were we getting into? When I was the destroyer sailor, you could hear the ocean sloshing against the hull. You knew that less than an inch of steel was all that separated you in your bed from the ocean. Many times my mind drifted to thoughts of what it might take to puncture that barrier between us and the sea and have seawater just come pouring in. On the battleship, you really didn’t hear much of anything going on outside. Just the wine of our ship steaming through the night. And the guns. You could definitely hear the guns from the inside. Then, it occurred to me what had happened. Our berthing compartment was directly below turret two. I realized that the other watch section of firecontrolmen, the shipmates that I worked with in the fire control division, had gone to work down in the main battery plotting room. I had heard the very first 16 inch gun to fire from the Missouri in Desert Storm. When I realized that, I just rolled over and went back to sleep. There would be a long day for me when it was our turn to take over. Fortunately, there was no mine strike that day. One day, captain Kaiss came on the 1-MC and excitedly announced, Seaman White, report to the bridge! Oh boy, I thought, what is going on? A few minutes later, Captain Kaiss was back on the 1-MC, Seaman White, for exceptional performance of your duties as a forward lookout, spotting a potential threat to your ship, a mine in the water, I hereby award you the Navy achievement medal. Just like that, we learned that sailors could be decorated if they were the first one to find a mine in the water and prevent the ship from hitting it. When we discovered we were in a minefield, the ship came to a full stop and an explosive ordnance(EOD) team was sent for. Later that day the EOD men flew to our ship by helicopter and made preparations for destroying the mine. Everyone who was not on duty was allowed to go up on deck and watch. The ordinance disposal team took a motor whaleboat out to the mine, keeping a safe distance and then the team entered the water to swim up to it and place explosive charges on it. The team set a timer, got back in the motor whaleboat and moved away to a safe distance. Then we all waited for the mine to explode. When it did, it shot a column of smoke and water straight up in the air. 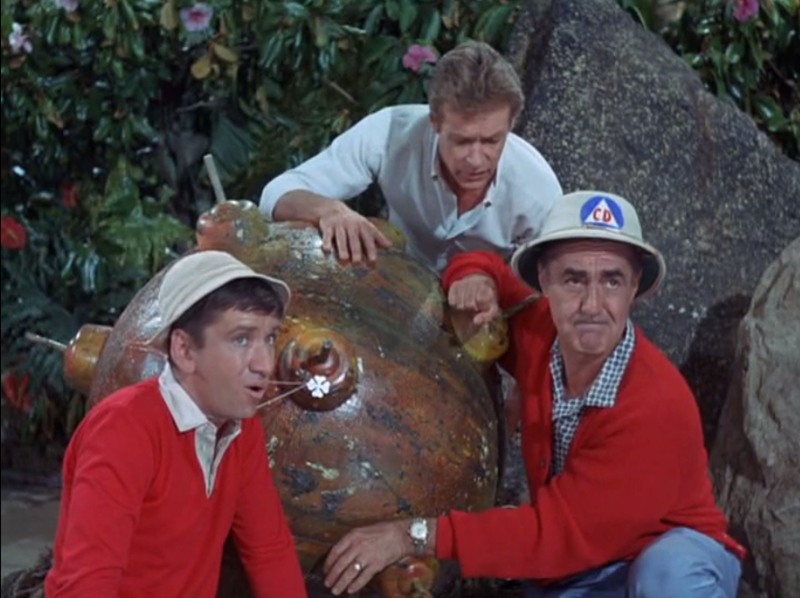 The mines I saw looked just like one of those World War II mines that I remember seeing in an episode of Gilligan’s Island. Remember that episode? The mine was magnetic and the castaways all got stuck to it with their watches and rings and jewelry. But the safety of our ship was no laughing matter. We were thankful that the menace was destroyed without incident. Someone from our public affairs office recorded video footage so we could see up close what it looked like. There is a short clip of it in the A Call To Crisis film that is posted online. I’ve done a little bit of searching online to see what other sailors might have posted shared had to say about the mines during Desert Storm. I did one find one video filmed by one of the officers aboard the USS Princeton. That video shows the damage caused by the mine. I haven’t found anything yet from the USS Tripoli. Something is making me think that there were injuries or perhaps even deaths caused by the mind strikes. I will have to look into it further.